, countess of Pembroke, sister of the preceding, manied in 1676, Henry earl of Pembroke; and her eldest son, William, who succeeded to the titles and estates of his father, is the ancestor of the present family. She had received a liberal education, and was distinguished among the literary characters of the age for a highly cuLtivaied mind and superior talents. Congenial qualities and pursuits united her vith her brother sir Pnilip Sidney, in bonds of strict friendship; and, as we have mentioned in his article, he wrote the “Arcadia” for her amusement. To her also Mr. Abraham Fraunce devoted his poetic and literary labours. The countess por 5 sessed a talent for poetical composition, which she assiduously cultivated. She translated from the Hebrew into English verse many of the Psalms, which are said to be preserved in the library at Wilton, and in this was assisted by her brother. She also translated and published “A Discourse ok Life and Death, written in French by Phiiip Mornay, done into English by the countess of Pembroke, dated May 13, 1590, Wilton:” Lond. 1600, 12mo. 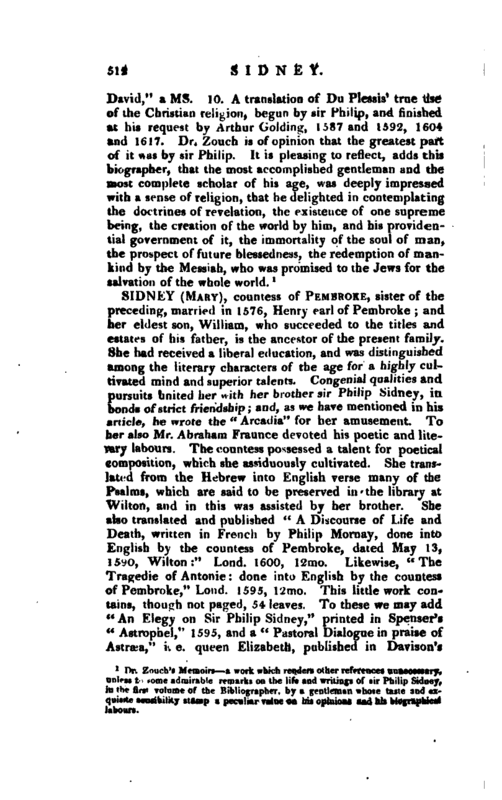 Likewise, “The Tragedie of Antonie: done into English by the countess of Pembroke,” Lond. 1595, Umo. This little work contains, though not paged, 54 leaves. To these we may add “An Elegy on Sir Philip Sidney,” printed in Spenser’s “Astrophel,” 1595, and a “Pastoral Dialogue in praise of Astrsea,” i. e. queen Elizabeth, published in Davison’s | “Poetical Rapsody,” 1602. A long poem in six-line stanzas, entitled “The Countesse of Pembroke’s Passion,” occurs among the Sloanian Mss. No. 1303. Time shall throw a dart at thee." 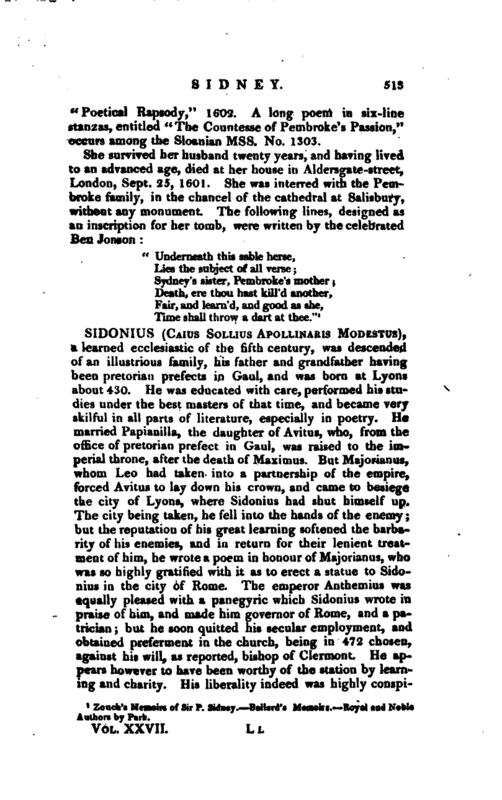 Zouch’s Memoirs of Sir P. Sidney. Ballard’s Memoirs. Royal and Noble Authors by Park.